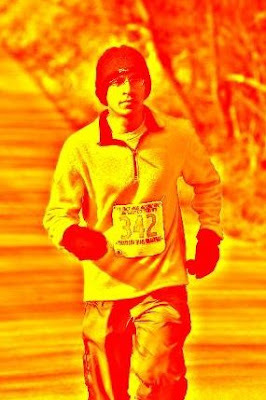 I finished the Tecumseh Trail Marathon that I had this weekend in 5:02:10. It was a very tough race—lots of steep hills and some slippery slopes (because of the ice on trails). Fortunately, there were no major mishaps, though several runners fell and suffered minor bruises. My friend Nick and I completed the race safely. Did I achieve my peak performance? I would say YES, even though it took me a lot longer to finish than I had expected. My knee did bother me for most of the race, though not in a debilitating way. It was very strange but I woke up with a knee pain the morning of the marathon; the pain was not on the outside of knee that is related to the IT Band, but on the top inside. It's the first time I experienced it, so not sure what it was. Anyway, the pain went away after some moving around inside my house, but it recurred when I started running the race. So, I had to stop several times during the race to apply some pain relieving gel on my leg. My first stop was before the first mile, and that stop slowed me down significantly, because I fell along with a pack of slower runners. With the majority of the trails being single and narrow, it was very difficult to overtake the slower runners ahead of me. It took me over 21 miles to catch up with Nick. My knees (including the IT Band problem) continued to give me some pain through out the race, but not in a major way—the Arnica gel sure helped. Towards the end of the race, it seemed like I had a lot more energy left in me compared to the other runners running beside me. I never thought I would make a dash to the finish line in a marathon, but that's exactly what I managed to do, and it sure felt great finishing strong. Nick finished six minutes after me, though it was just his first marathon. 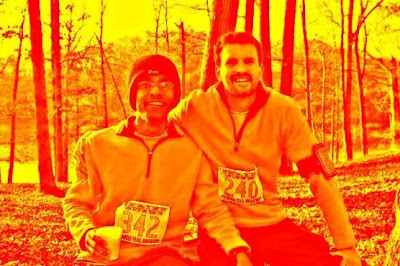 Finishing a long and grueling race was exhilarating, but the best part was having friends waiting at the finish line. Our friends, Katie and Ana (Nick's wife) had waited outside for over an hour in the bitter cold to make sure that they don't miss us at the finish line. I was very touched by their gesture. In the end, it's the presence of friends that made the Tecumseh very special. May everyone be blessed with great friends in life. PS: The Tecumseh was one of the most well organized race I have seen so far. The aid stations were awesome! Kudos to the organizers for putting up such an excellent race, and a huge thanks to the generous volunteers who stood out in the cold all day.